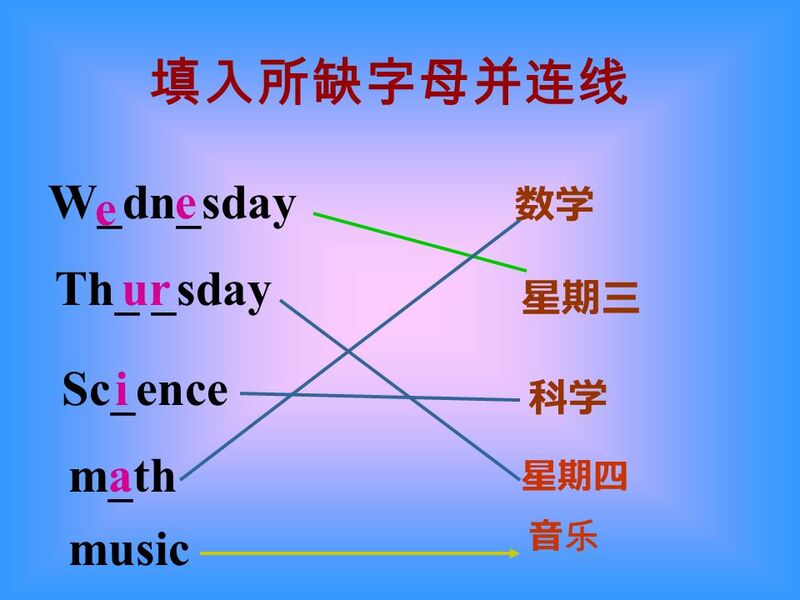 M__nday o T_esday u i i Engl_sh Ch_nese PE. A: Today is Tuesday. We have an English class today. B: Chinese! Great! I like English. A: Me,too. Oh, its. 2 A: Today is Tuesday. We have an English class today. B: Chinese! Great! I like English. A: Me,too. Oh, its 9:10. Time for our English class. B: Yeah! Lets go to the classroom. 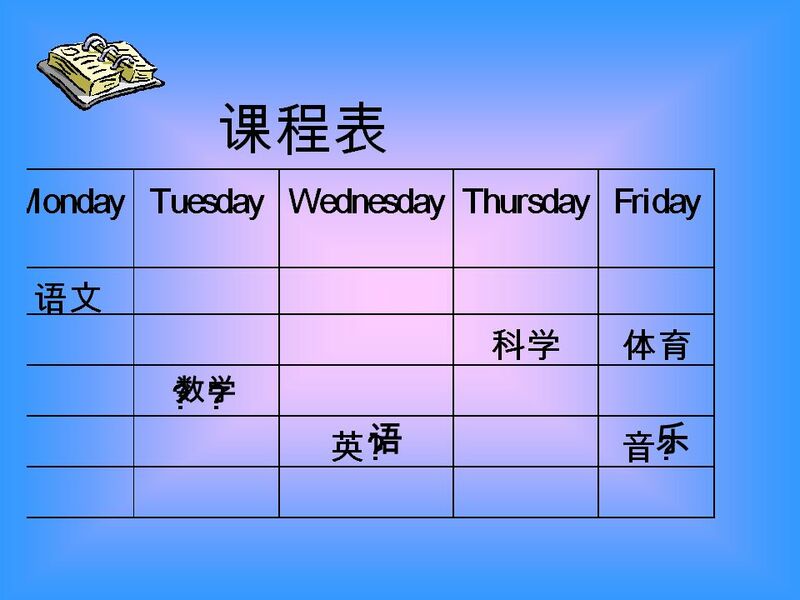 A: OK.
3 A: Today is tuesday. We have a English class today. B: Great! 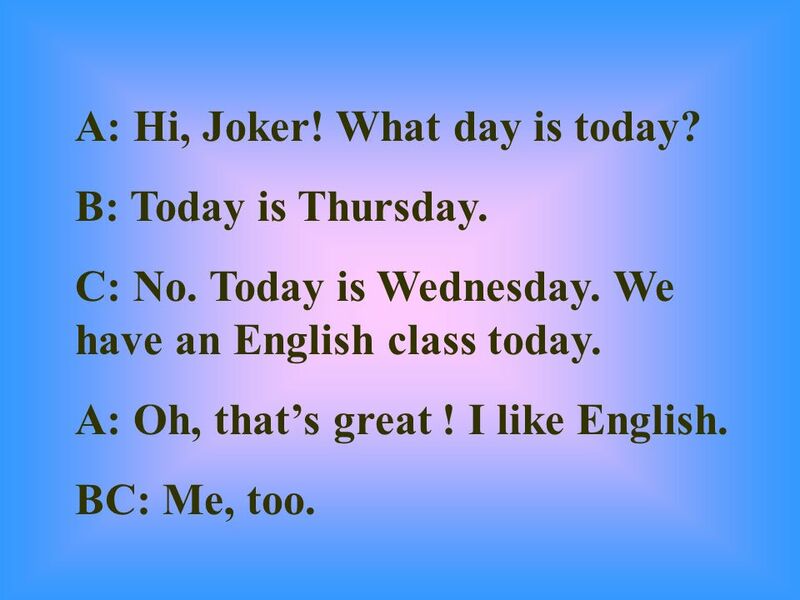 i like English. A: Me,too. Oh, it. s 9:10. time for our English class. B: Yeah! Lets go to the clessroom. A: OK T n I T a. 4 Whats your favorite class? English! English! English! Whats your favorite class? Chinese! Chinese! Chinese! Whats your favorite class? Can you tell me,please? 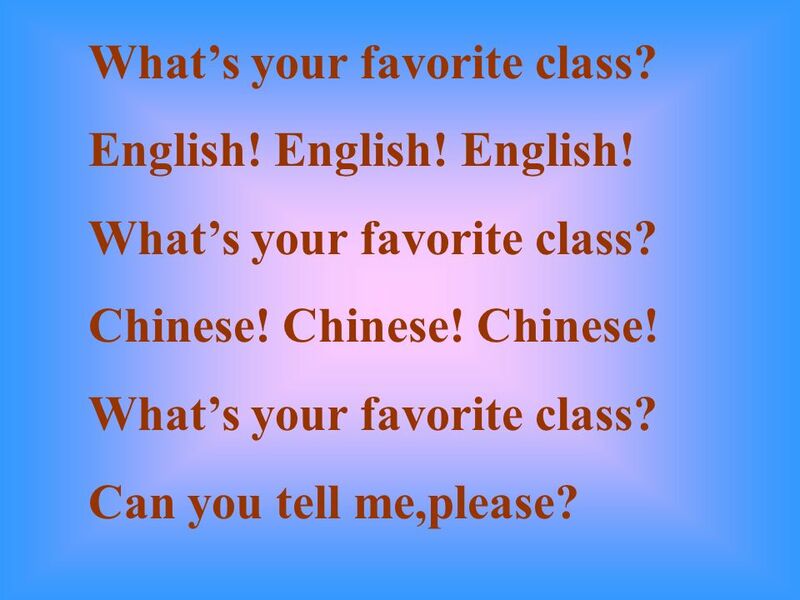 5 Whats your favorite class? Can you tell me,please? 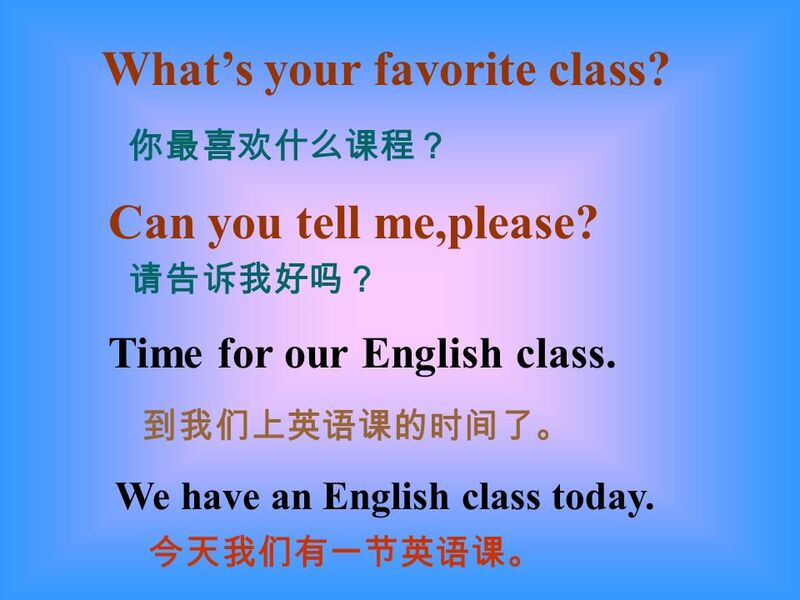 Time for our English class. We have an English class today. 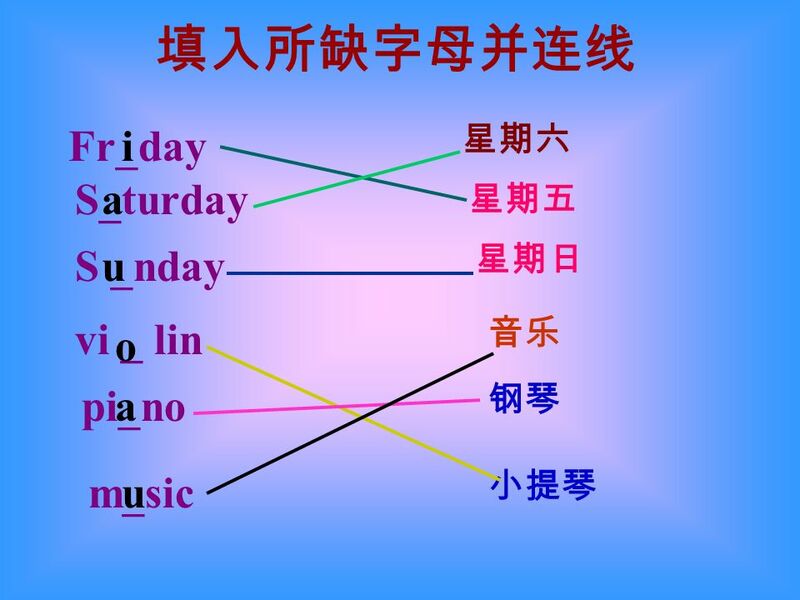 6 Lesson 4 1 What day is today? 2 Today is Thursday. 3Oh, we have a science class today. 4 Great! I like science. 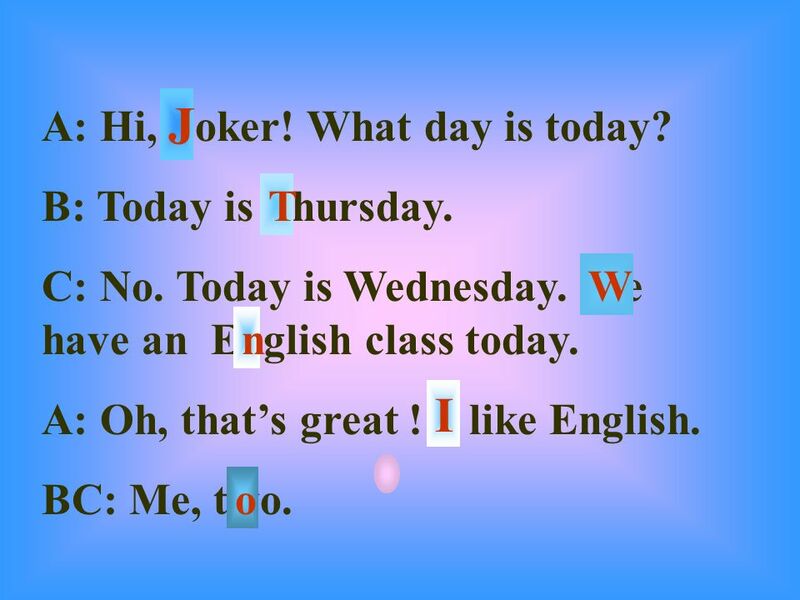 8 A: Hi, Joker! What day is today? 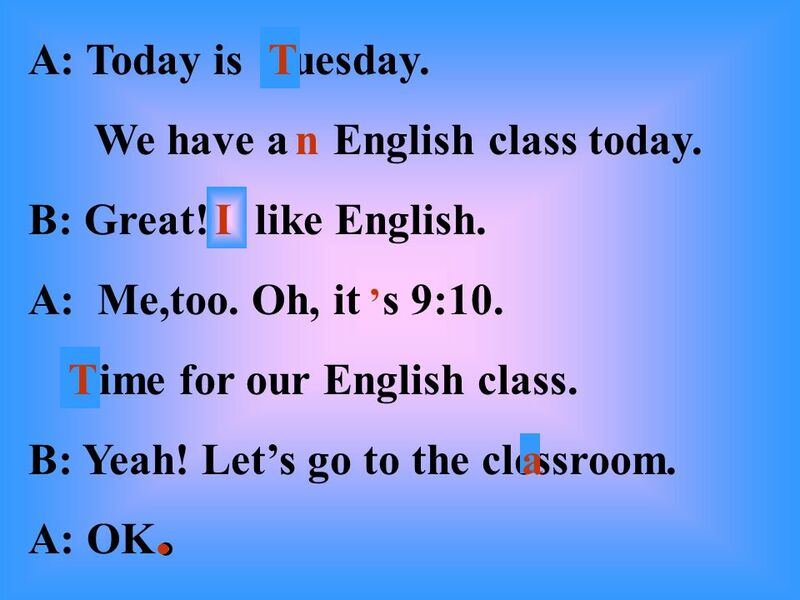 B: Today is Thursday. C: No. Today is Wednesday. We have an English class today. A: Oh, thats great ! I like English. BC: Me, too. 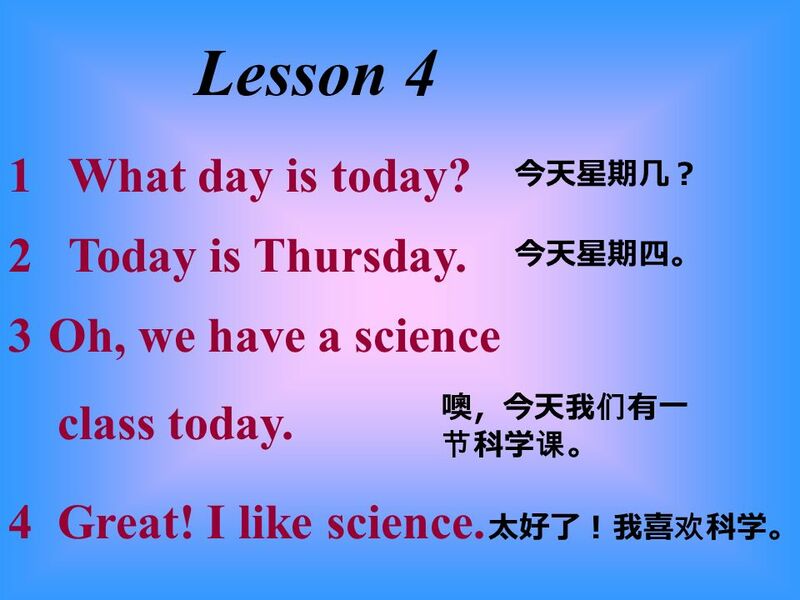 11 Lesson 5 3 Today is Friday. We have a music class today. I forgot my flute. 4 OK. 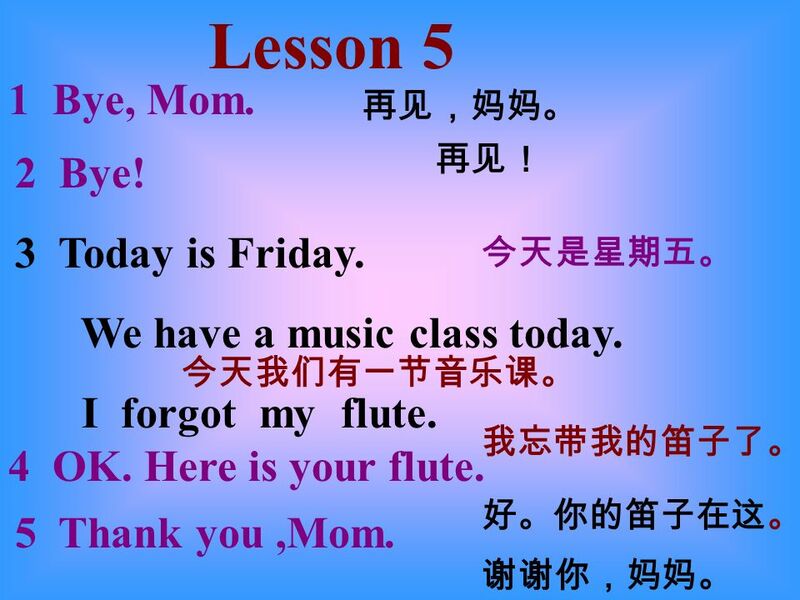 Here is your flute. 5 Thank you,Mom. 1 Bye, Mom. 2 Bye! 13 A: Hello! This is Linda. Is Xiao Hui in? B: Yes. Hold on, please. 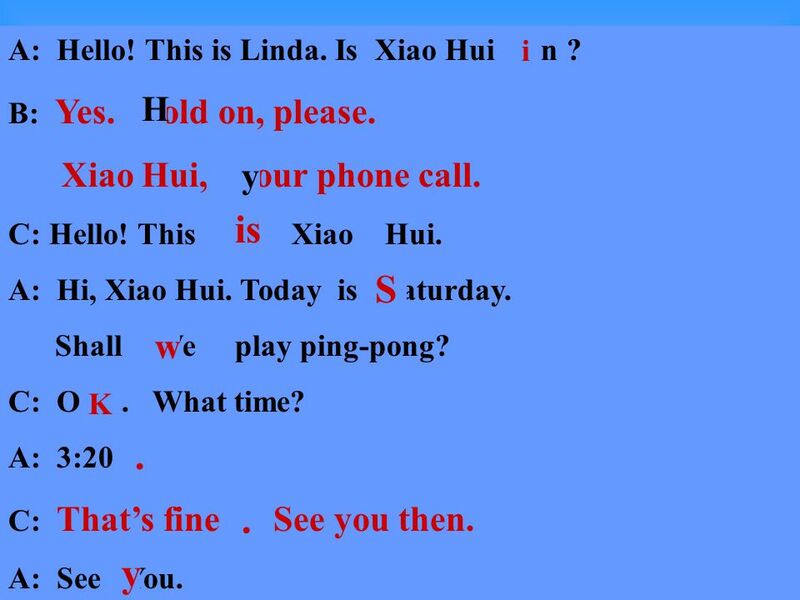 Xiao Hui, your phone call. C: Hello! This is Xiao Hui. 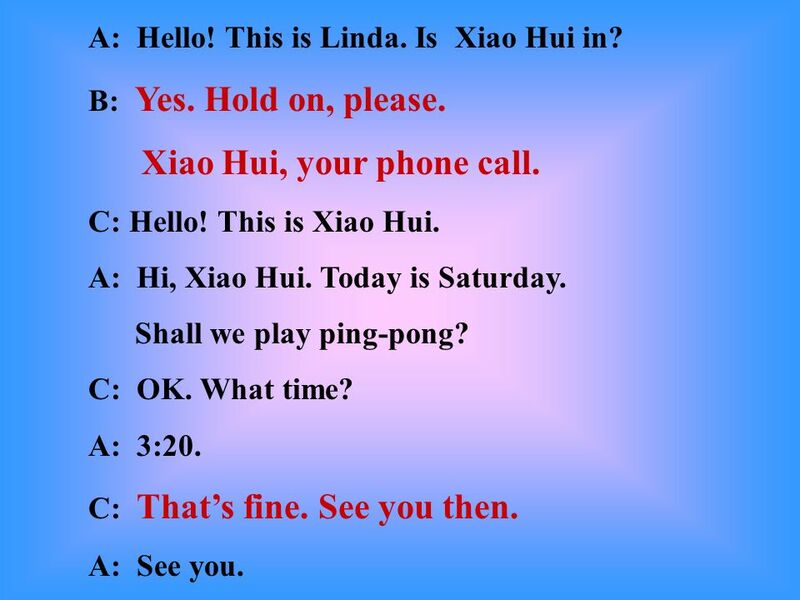 A: Hi, Xiao Hui. Today is Saturday. Shall we play ping-pong? C: OK. What time? A: 3:20. C: Thats fine. See you then. A: See you. 14 A: Hello! This is Linda. Is Xiao Hui on ? B: Yes. hold on, please. Xiao Hui, Your phone call. C: Hello! This am Xiao Hui. A: Hi, Xiao Hui. Today is saturday. Shall We play ping-pong? C: Ok. What time? A: 3:20 C: Thats fine, See you then. A: See You. 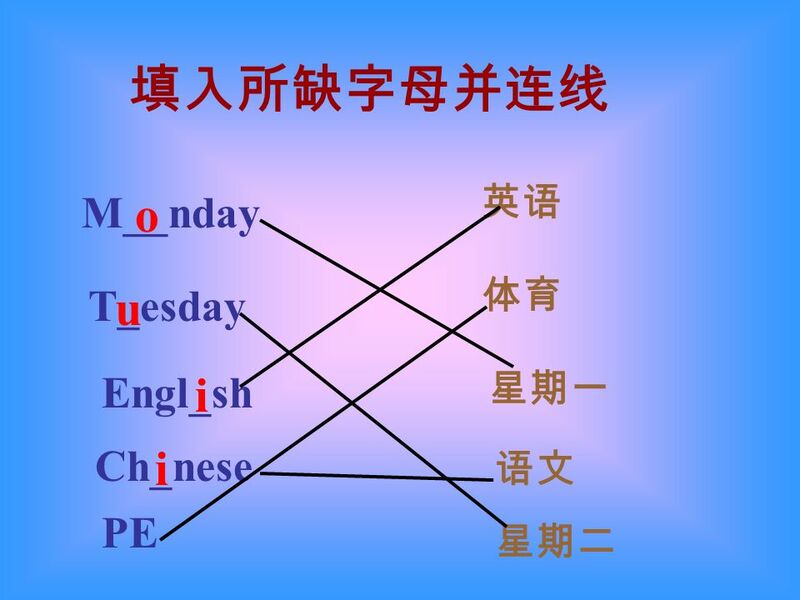 i H y is S w K. y.
Download ppt "M__nday o T_esday u i i Engl_sh Ch_nese PE. A: Today is Tuesday. We have an English class today. B: Chinese! Great! I like English. A: Me,too. Oh, its." parents a drawer a string find go outside. Whats the weather like today? Whats the weather like last Friday? It is rainy, isnt it ? It was sunny, wasnt it ? Now Todds Box Cumulative Review. so Todds Box Cumulative Review. Shall We Talk? Passport P.3-4 We ’ re thankful ! SPU STAFF TRAINING Sripatum Institute of Language and Cultures Lesson 9: Cancelling an appointment. ‘The Europe of Myth and Legend ’ Useful Vocabulary - ENGLISH. P.6 English Lesson Greetings How do you do, I’m Peter Chan? How do you do, Mr Chan? I’m very pleased to meet you. people meet at the first time. REVIEWREVIEW. REVIEWREVIEW are you Are are they are you. Unit 5 – Meeting Tourist in Rio de Janeiro Class 2 – Final Class English Works. English Lesson 104 On the phone & a date 在电话和日期. English Lesson 104 On the phone & making an appointment 1.Making a phone call 2.Making an appointment. Ask the students to have free talks. A:How do you get to school ？ B:I take the bus. A:How far is it from your home to school ？ B:It’s three miles. A:How.